Our ‘Hawaiian Kiss’ Combination features some of the largest blossoms you will find on any calibrachoa, in fantastically tropical colors. Tiki Soft Pink could also be called strawberry lemonade with its soft pink petals, lemon yellow throat and vivid strawberry colored halo around the throat. 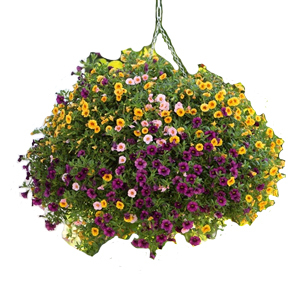 Add the rich, royal purple and the gold and burgundy of the other Aloha calibrachoa and you have the makings of a purely tropical looking combination.